Day 3 of Navrathri, and mum completed the 3 days of Durga Pooja (3 days each for Durga-Lakshmi-Saraswathi) Today the prasadam was Lemon Rice, a simple to make, yet delicious rice variety that's quite popular in South Indian kitchens. The variations one can make with this dish is quite amazing, from a simple seasoning to veggies, peanuts, one's creativity is the limit!! 1. Boil or pressure cook washed rice with 1 cup water. 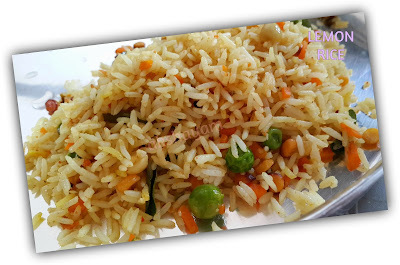 Take care not to over-cook, we need a pulao consistency where the grains are separated but cooked. Once done, spread on a plate gently using a fork and let cool to room temperature. 2. Heat oil in a wok, add mustard seeds and let crackle. Add the bengal gram, curry leaves and chopped green chili. Saute for 1 minute. 3. Now tip in the vegetables along with turmeric powder and salt and let cook till 3/4th done. 4. Once the vegetables are done, add to the rice. Add lemon juice as well and again using a fork, gently mix all of these with the rice till uniformly done. Check for salt. Optional to garnish with chopped coriander. Warm the rice before serving.